Are you looking for that magic bullet for your relationship? Something to divorce proof your marriage? Unfortunately, there is no such thing as a 100% guarantee, but I think I know something that comes pretty close. Years ago, a seminary professor shared a statistic with me I will never forget. It’s one I’ve shared with couples for over 15 years. It’s the closest thing I know to divorce-proofing your marriage. Do you want peace, power, and protection for your marriage and family? Then pray together! Yep, that’s right. Less than ONE PERCENT of couples who pray together on a regular basis divorce. I don’t know of any tool that can rival that statistic, but unfortunately not many are tapping into the power. Family Life surveyed thousands of Christian couples and found a sad and alarming statistic. You’ve probably heard one out of every two marriages end in divorce, but have you heard the statistic isn’t any better for Christian couples? Why is that? Maybe it’s because only 4% of Christian couples pray together on a regular basis. No wonder the divorce rate among Christian marriages isn’t any better than society in general. BE POSITIVE- No throwing your spouse under the bus. Thank God out loud for your partner. Pray blessings and protection over your family. Focus on why you love them and thank God for them. It will fill the heart of your spouse and draw you closer to the Lord and each other. BE BRIEF- Keep it simple and to the point. Make sure whatever routine you begin you can sustain. It’s not the time to show off your big vocabulary and flowery prayers. You want your spouse to feel comfortable with you praying out loud. BE CONSISTENT - Find a daily time that works with you both and stick to it. Consistency is important but so is flexibility. If your schedule gets crazy and you have to mix it up, no worries. There are no rules. BE TRANSPARENT- Don’t be afraid to share your heart with God in front of your spouse. Praying out loud alongside your spouse builds spiritual intimacy and creates a bond that cannot be easily broken. Because you are looking for transparency, a mealtime prayer isn’t the best option. You need time and privacy as a couple not a growling belly worried the food is getting cold. BE PATIENT- Rome wasn’t built in a day. Building spiritual intimacy takes time, but it is so worth it. God can do beautiful things with folks who seek Him above all else. So there you have it. My top five suggestions for praying together as a couple. After hearing those startling statistics over 15 years ago, my husband and I began praying together almost every evening. I’ll admit. It was awkward at first. We were used to praying rote prayers as a family not heartfelt ones privately. 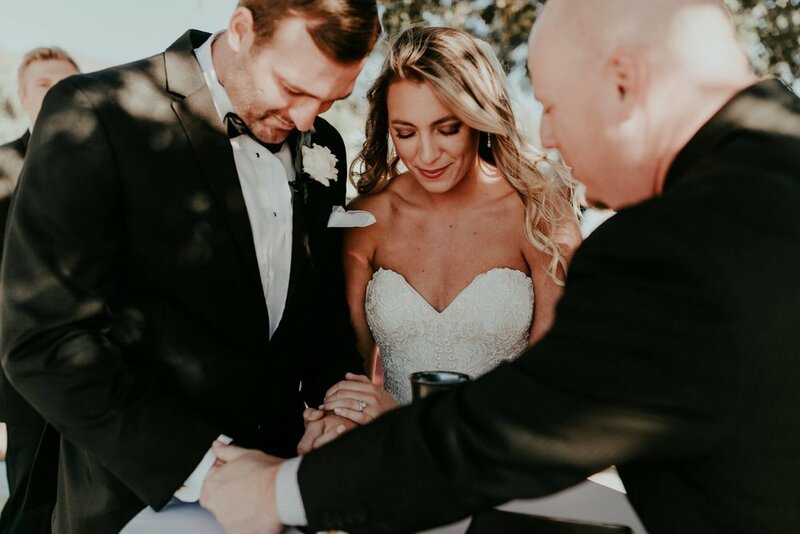 As the spiritual leader in our home, my husband goes first and prays for me, our marriage, our family and anything else laying heavy on his heart that day. Then I do the same. Often, we’ll share things in that prayer time we haven’t mentioned all day with one another. It’s hard to harbor negative feelings and unresolved issues when you’re praying together on a regular basis. So why not grab your spouse and start today? What do you have to lose? It may just be the tie that binds you together and draws you closer to each other and to the Lord.